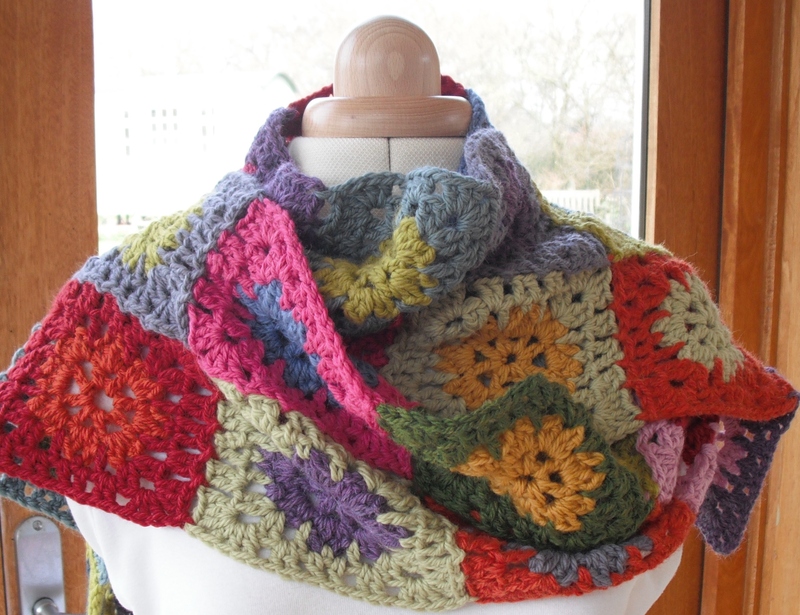 I have just completed a very colourful scarf, quite traditionally crocheted using square motifs. It is one of a series of scarves that I am designing this year – one for each month. I am a little behind, almost the end of March and this is the February scarf! It is unusual for me to design something using a square motif (you know how I love hexagons) and also very colourful when I tend to be a lot more subtle. But it is nice to have a little colour occasionally, isn’t it? I just hope it isn’t going to be a trend for me – lots of colour and lots of squares – feels a bit too traditionally ‘granny’ to me! I was reminded about traditional crochet very recently. It is a long story that I will not bore you with, but a good friend told me she first thought of crochet being something used for those kitsch toilet roll covers – you must remember them, dolls with huge crochet skirts, frequently in pink. Oh, my how horrendous they were, I can laugh about it now but there was a huge trend for them when I was young! My thoughts turned to how I use crochet in the home. I love throws and blankets, absolutely love them. Crochet lends itself extremely well to throws and blankets. I have them for the bed, the sofa, the cat bed (yes, a very cosy spoilt cat! ), chairs, the garden – they are very useful and versatile. I have made cushion covers also and I am making some now to match the colour accent in my lounge. Bunting also features – mainly at Christmas but I do have some in my shed, and sometimes drape some in my craft room. Some customised jar covers, which hold a host of hooks needles, pens etc. And finally a small curtain over the tiny window on our front door. 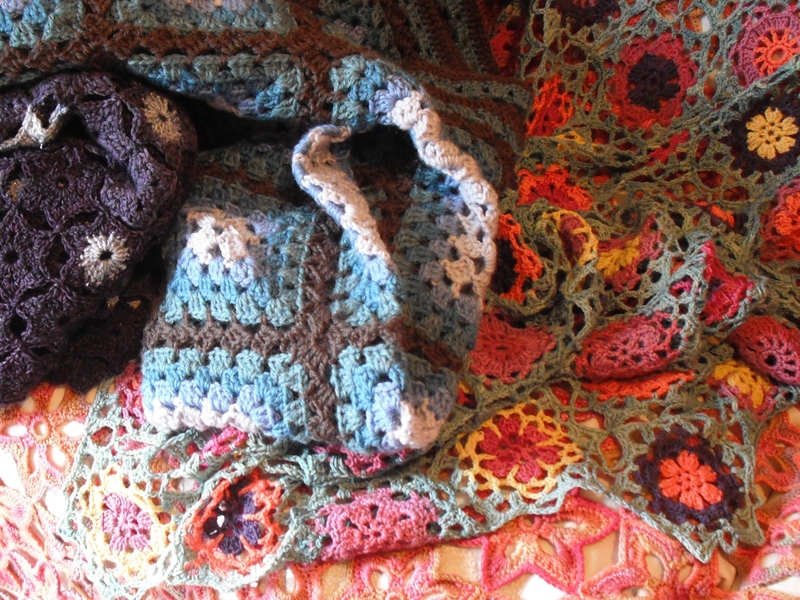 And that’s about it – the total of my home use of crochet. For me that’s just enough but I expect some people may say it is too much. Still thinking about this I picked up a couple of crochet magazines and looked at home crochet ideas (not that I plan to expand my home use!). I was surprised to see there is a huge amount. It didn’t used to be that way. Looking at older magazines I’d say roughly 90% of the patterns were garments and accessories and 10% home. Very recent magazines seem to be the reverse (mmmmmm………… maybe a tiny exaggeration!). Now if the home patterns were mainly throws and blankets I wouldn’t be too concerned, but it isn’t and I am fearful those toilet dolls will be making a comeback soon. This worries me. Is this a dumbing down of the crochet world? I do hope it is a short lived trend, because there is so much more to crochet than little things for the home. It is a glorious craft and should not be confined to four walls – wear it and be proud! So tell me – do you do much crochet for the home? And what do you think of magazine trends? I would love to know your views. Thank you. It was very quick to make once I started it, and really is a great stash buster! I am proud to say I have absolutely no crochet home items in my house except for blankets. I remember the toilet dollies with total distain, maybe they are so kitsch that they are trendy now or maybe the designers don’t remember how awful they were in the first place. And I totally agree with you about the crochet dumbing down, it really worries me, I want to see exciting and innovative design which will move the craft forward, rather than the same old cup cozies and i pod covers which will end up taking the craft back to the realm of toilet dollies.